Dropbox. Evernote. WeTransfer. Asana. DocuSign. And so many more. 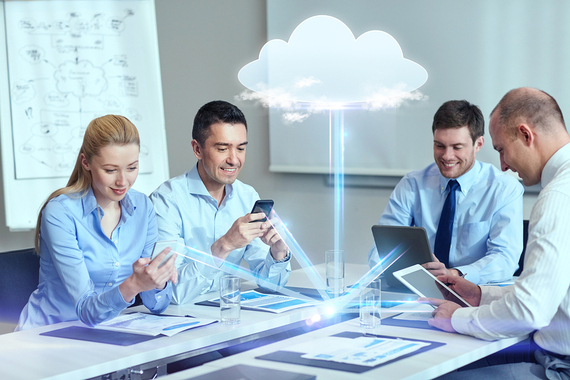 Your team relies on a multitude of cloud-based applications to help them do their jobs more efficiently. The stronger your team is, the more productive they are and the more competitive your business can be. But are they putting your business at risk? Your IT department is responsible for everything transmitted from the computers in your office, meaning it's up to them to keep your business data secure at all times. Russ Banham said in his Forbes article, "Why CIOs Should Be Happy About Shadow IT," "IDC Senior Research Analyst Mark Yates describes today's business environment as the Wild West, with employees doing whatever they want, technologically speaking, in the lawless land of shadow IT... Shadow IT reaps a corporate bounty in lower IT costs, increased flexibility, speedier task completion and a lot less hassle from IT. But...companies end up paying dearly for these perceived benefits: No centralized IT oversight fortifies organizational silos, impeding cross-functional collaboration and increasing security risks." As of August last year, Cisco determined, "IT departments estimate their companies are using an average of 51 cloud services, when the reality is that 730 cloud services are being used. And this challenge is only going to grow. One year ago, the multiple was seven times, six months ago it was 10 times, today it is 15 times and given the exponential growth of cloud we predict that by the end of this calendar year it will be 20 times or more than 1,000 external cloud services per company." This is where allocating a portion of your technology budget to monitoring Shadow IT (the technology your employees use without official approval) can be a useful and wise financial investment for your company's future. In "Brokering Change, One Cloud App at a Time," Mark Zimmerman, CIO of MarS Discovery District shares, "These unsanctioned--or "shadow IT" apps--are great for...employees, but they're a nightmare for someone...who works in IT and is tasked with making sure our network and sensitive business data remain secure." A Shadow IT solution enables you to peer into every computer, see which cloud applications are being used, explore their effectiveness, and then accurately assess whether the information your team is sharing using these applications is putting your company at risk, legally or otherwise. It can also help you determine which applications are the most popular and streamline a solution to use only the most effective, efficient, and secure ones company-wide. If it's your business, you need to have a handle on your security. You want to make smart and safe technology decisions that won't make you vulnerable. Tracking your Shadow IT is smart protection - ultimately it can save you time and money...and make you more money.